8 Is Forex.com Right for You? Wondering what the best platform is for your Forex trading strategy? Well you’ve come to the right place. Forex.com is a popular option for many modern traders, and today, we’re going to take an in-depth look at what it can do for you. Originally founded in 2001, Forex.com is a website with regulation in a lot of different countries. That means that it can give you some peace of mind while you trade. The site comes with some dependable trading platforms for both professionals and new traders alike, and the parent company GAIN capital holdings operates on the NYSE. With several kinds of account to choose from, the pricing structure for Forex.com is pretty easy to understand. In one account type, traders are able to pay the spread for every trade. Other accounts charge small commissions with a smaller spread. No protection for negative balance. Forex.com is a trading website that’s regulated in the US, UK, Australia, Canada, Singapore, Japan, and even the Cayman Islands. Because laws and regulations vary according to country, the products you can access in each area will vary too. For instance, you can only access CFDs outside of the US. Notably, all client funds are segregated from Forex.com funds, which does give you some protection for your money if the site goes through financial issues. There isn’t any additional insurance provided, however, unless you live in Canada. All Canadian funds are protected by the Protection fund for investors. Unfortunately, it is possible for client accounts to go into a negative balance, with no defenses offered here. However, your accounts will be monitored. If you don’t have enough margin in your account, the site will automatically begin to liquidate certain positions. However, this won’t always stop negative balances from taking place. The fast-moving nature of Forex means it’s difficult o predict what will happen in your account. While guaranteed stop-losses are available, they come at a cost. Typical stop losses will also protect you to some extent, but they can be subject to slippage too. On the plus side, pricing is very transparent and easy to understand. 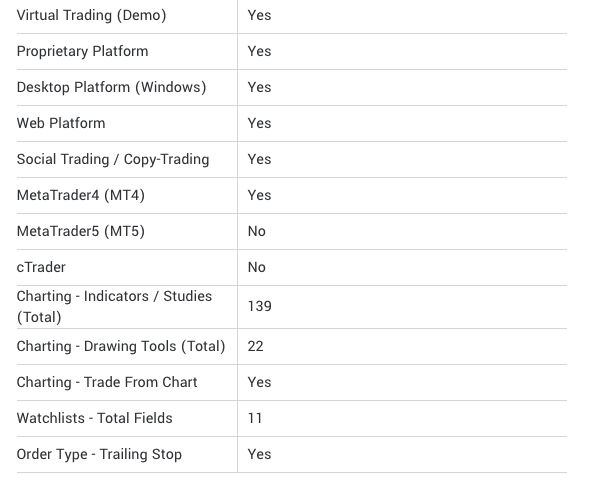 There are even functional free demo accounts available where you can practice your trading strategies. In terms of encryption, there isn’t anything available for two-factor or biometric authentication. Forex.com’s trading platforms are designed to support both the new trader and the Forex trading professional. This means that you can choose between advanced trading platforms like the MetaTrader 4, or other trading options like the web trader. Trading platforms are available via mobile and web access. Whether you choose to stick to the web trader or go into the advanced platform, you shouldn’t find trading difficult with Forex.com. You’ll be able to trade directly from your charts by clicking the buy and sell buttons. This gives you an order window where your profit target, stop loss and entry information is set. Inside the platforms, you can access everything from economic calendars to charts, news, positions, and order histories. There aren’t many drawbacks to the platforms at all. 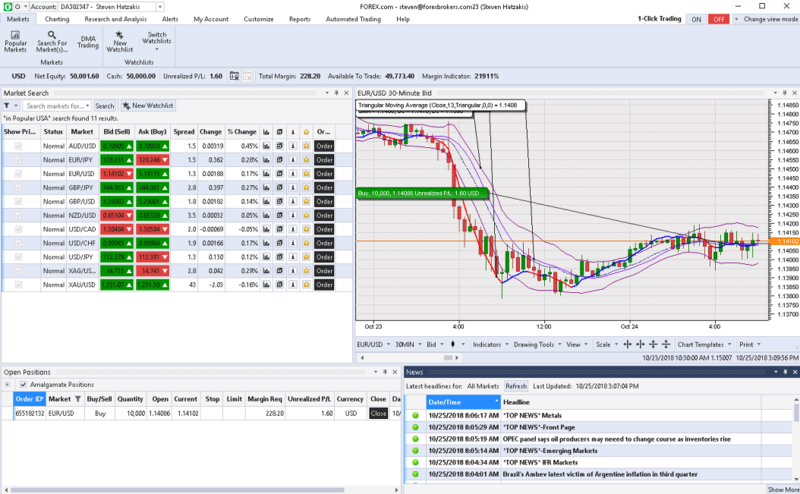 There are plenty of drawing and indicator tools, and it’s possible to integrate with NinjaTrader too. The mobile application is useful and easy enough to access too. It provides traders with an overview of all of their account information and allows for adding or withdrawing funds, viewing trade history, creating watchlists, accessing news, and viewing charts, among other things. You’ll also be able to easily navigate and set-up your systems. The charting feature isn’t a big benefit for the app, however. There are a limited number of indicators available to choose from, and many technical tools are missing. On the plus side, full order functionality is available, and you can place stop losses and profit targets when you’re trading too. Forex.com is a Forex trading platform; your products will depend on where you’re trading from. For instance, US clients can access 83 Forex pairs, alongside silver and gold, and clients outside of the US can trade with all Forex pairs and CFDs too. Trading for cryptocurrency is currently only available in the UK. Importantly, opening your account only requires fifty units of your chosen currency, and the minimum trade size on a currency is $1,000. This means that you’ll need a 20:1 leverage to open a trade with $50. As a market-making broker, Forex.com doesn’t give clients access to the raw prices offered in the market. Instead, there’s a slight markup on the prices that you can access. This is something you’ll be able to see when you compare a DMA account to a standard account. With a DMA or Direct Market Access account, there’s no markup on your spread, but you will have to pay a commission. It’s up to you to decide whether you want to pay the commissions or the fees. In terms of pricing, Forex.com isn’t as good as many other international brokers, as most can provide lower commissions and tighter spreads. Commission account traders and standard account holders might benefit from using the Active Trader Program. This option is available for anyone who has an account with $25,000 in opening fees or trades up to $25 million per month. The program isn’t available for DMA holders, however. It gives customers access to volume-based reductions on fees. In terms of additional fees, accounts with less than 10 thousand in USD that have not been active in 12 months will need to pay an inactivity fee of $!5. However, if you have more than $10,000 in your account, there is no inactivity fee. There aren’t any additional fees to consider with your deposits, and withdrawals are free if you opt for ACH and check payments. However, US wire transfers for less than $10,000 come with a fee, and other wire transfers cost $40. Transfers are free if you’re withdrawing more than $10,000. If you need help with your Forex.com account, there are various ways to get in touch, including live phone support and online chat. You’ll also be able to access tutorials and FAQs on the Forex.com website. Unfortunately, online and phone support aren’t available 24/7, but they are there when you need them from 10 amto 5 pm, Sunday to Friday. Social media support isn’t available either, although there are social accounts for the company. Live chat is regulated by a bot, so you’ll be limited in the questions you can reasonably ask. It’s probably a good idea to contact the company via email if you have complicated queries. Additionally, phone support is easily the quickest way to get supportfrom a live person. There’s a menu you’ll need to sift through at the beginning of your call, and the wait times for your conversations will vary according to the call volume at that time. Is Forex.com Right for You? If you’re a very active trader in the Forex world, then Forex.com is a good platform, because it gives you lower trading costs for more trades. Thisis also a goodplatform for infrequent traders,because the charges aren’t too bad if you’re justhandling a few trades every now and again. However, if you’re somewhere in the middle, you might not appreciate the hefty fees and trading costs involved with an account on Forex.com. Disclaimer: By trading with securities you are taking a high degree of risk. You can loose all of your investment money. You should start trading only if you are aware of this risk. Business24-7 is not providing any investment advice, we only help you find the best broker based on your needs and preferences. Business24-7 is free for everyone, but earns commission from some of the brokers. We get commission with no additional cost for you.